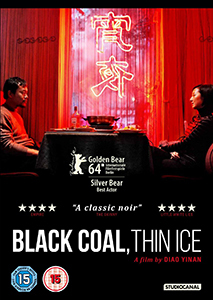 Diao Yinan’s noir tale Black Coal, Thin Ice (2014) bagged him the Golden Bear award at the 64th Berlin International Film Festival. For his portrayal of a boorish, obsessive cop haunted by an old case, who spends his days in a freezing cold northern town in China pestering a swell-looking babe working in a dry cleaners, Liao Fan received the Silver Bear for Best Actor. The film in question is resolutely pessimistic. Relationships are really just power struggles defined by emotional wants and needs. A presumptuous lawman believes that playing the white knight will end with the object of his fevered desire throwing her arms around him and love blossoming from the soil of prior disillusionment. What a dope. “You think anyone ever wins at life?” That line of dialogue succinctly nails the vibe that reverberates throughout much of Bai Ri Yan Huo, which literally translates as ‘daylight fireworks’. All are equal in despair: detectives, dames and psycho killers. Set between the years 1999 and 2004, in a wintry industrial town, a serial- murderer’s modus operandi is baffling local fuzz good and proper. Body parts are turning up in coal deliveries at power stations across a massive area. All at the same time of day. How the hell is this even possible? The English-language title may invoke the good old days of pulp fiction, but Black Coal, Thin Ice is really an art movie wrapped in snug genre clothing. It’s easy to see why it won the Bear at Berlin. As well as being moodier than a Nine Inch Nails soundscape and crackling with barely concealed sexual tension and brimming with angst, Jingsong Dong’s cinematography is sublime. The film looks so beautiful. And neither is it a case of visual grandstanding for the sake of cinema’s sake. There is subtlety at play that is quietly impressive. Whether it’s a seasonal transition via a road tunnel – from clammy summer to the dead of winter – or faces bathed in coloured electric light as they travel on a Ferris wheel in the dark. Mixing daytime exteriors and pastel tones with night-time garish neon, brings out not only neat pictorial contrasts, but also the rich poetic symbolism that envelopes the characters in their search for a second chance and an escape from the past. There are minor narrative faults. The line between character study and the demands of the whodunit sit a bit unsteadily. Then again, isn’t life messy? Who really cares when a film is so aesthetically captivating? Black Coal, Thin Ice is a majestic neo-noir. This review was originally published to coincide with the film’s UK theatrical release in June 2015.